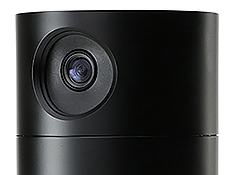 Smart Speaker VC-FLX1 has a built-in HD webcam and a variety of sensors that interface with the Toshiba Smart Home Services cloud-based home management solution (learn more at www.TSB-SmartHome.com) and free companion Toshiba Smart Home App for iPhone, iPad, and Android™ devices. Use the camera and app to monitor activity in the room, store recorded footage in the associated cloud service, and manage the home climate remotely when configured with compatible smart control devices such as smart thermostats. A camera lens cover is included for privacy. When used in conjunction with the speaker’s built-in microphone and camera, you can use Toshiba Smart Home App to converse with anyone in the same room as VC-FLX1. This helps you stay in touch with family, even a quick hello from work, and can keep you in easy reach when you’re away. Smart Speaker VC-FLX1 has sensors to detect motion, light, sound, temperature, and humidity. It can automatically manage connected and preconfigured smart devices, such as smart lighting and thermostats, according to your Toshiba Smart Home App presets. With supported smart devices connected, you can heat and cool rooms using the app before you return home. Ask Smart Speaker VC-FLX1 to control connected Alexa enabled lighting devices, thermostats, and other compatible smart home solutions by voice. Alexa boasts a deep library of skills to enable voice control of smart devices from the world’s leading brands. 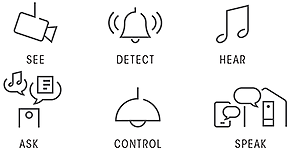 VC-FLX1 also supports Zigbee® and Z-Wave® protocols. Put your phone down when cooking, cleaning, or playing with the kids and let this speaker handle your requests instead. Alexa can answer questions, play music, quote a recipe, set timers, or read an audio book from Audible. Ask for weather and traffic updates, order a pizza, or book a cab, all hands-free. Spend more time in the moment, and enhance your life without distraction. With built-in access to almost limitless streaming music and internet radio from leading services such as Pandora®, you can enjoy your favorite albums and playlists or discover new music just by asking. Raise and lower volume, skip tracks, and change music all by voice. An exclusive ODMD (Onkyo Double Molding Diaphragm) full-range driver features a robust transducer with a strong, flexible diaphragm gasket to enable extended driver excursion. This small yet powerful driver reproduces a frequency bandwidth rivaling larger drivers with excellent vocal fluency and taut, lively bass.. The ODMD design expresses vocals with particularly intimate fluency. Dual-band Wi-Fi selects the best band to avoid network traffic and radio interference. The result is a fast and secure connection, even where range extenders are used in your home network. For added versatility, Bluetooth is also built in to stream virtually any audio from your or your guests’ smartphones or tablets without needing to connect to Wi-Fi.